Saturday, March 7 was a night of mixed emotions for the SMA prep team as they celebrated the careers of all four graduating 3-year Flames who have contributed so much to the program. All four girls head off to DI US College programs this fall. All the best girls! TOURNOI PROVINCIAL HOCKEY FEMININ DE QUEBEC. The Flames enjoyed a solid weekend, playing very talented teams in the Open Division, including host CEGEP LImoilou as well as CEGEP Andre-Laurendeau of Montreal and CEGEP Rimouski and the Toronto Aeros. Various sightseeing and historical visits to Old Quebec, downtown and the St. Lawrence River Seaway were mixed in along the way TO make for a most memorable experience for everyone. 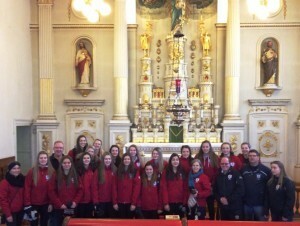 Pictured above is the team on Sunday, Feb 1st visiting the Eglise Notre-Dame-des-Victoires in Old Quebec. Canada’s National Women’s Under-18 Team finished with the silver medal at the 2015 IIHF Ice Hockey U18 Women’s World Championship after a 3-2 overtime loss to the United States on Monday, January 12, 2015. Congratulations girls! And a special congratulations to SMA Flames Prep forward Christian Higham for playing for Canada, way to Hold High The Torch! 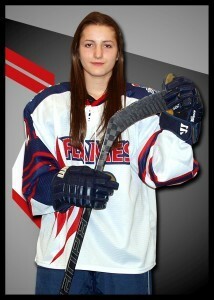 Congratulations to Christian Higham for making the 2014-15 National Women’s Under-18 Team. Click here to read a Sou’wester news story about Christian. Click here for Team Canada U-18 webpage. The St. Mary’s Academy Flames Prep team traveled by bus south to Faribault, MN to participate in the Shattuck-St. Mary’s Nov 14-16, 2014 Jamboree. 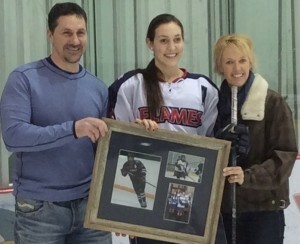 The Flames enjoyed another good weekend, with three straight victories over Shattuck’s U16 team, Minnesota Revolution and Thunder Bay Queens, after a tough 2-1 loss to Yellowhead Chiefs to begin the proceedings. 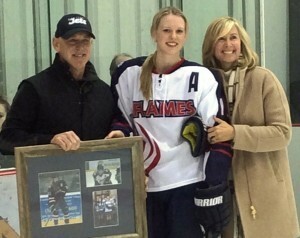 The Flames Prep outscored their opponents 13-4 in four games and came away with a 3-1-0 record. 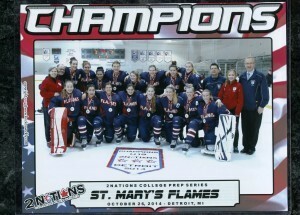 The weekend of October 24-26, 2014 saw the St. Mary’s Academy Flames Prep team win the U19 2014 Detroit Two Nations College Series Cup. The Flames Prep team went on to a 2-0 victory defeating one of the top teams in North America, Shattuck-St. Mary’s U19 out of Faribault, MN. The Flames Prep outscored their opponents 14-4 in five games at the U19 level. The team came away with a 4-0-1 record. Link to Winnipeg Free Press article. Your Flames are now 7-3-3 in 13 games as they prepare for the Two Nations College Prep Series October 4 to 26, 2014 in Detroit, Michigan. 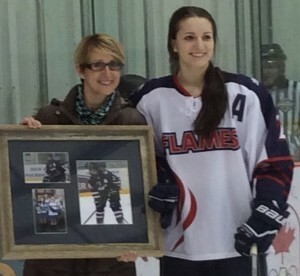 The Flames took part in the third annual Pembina Valley Thanksgiving Classic from October 10-12, 2014. While the team started out a bit slow, our young ladies quickly found their legs and got stronger with each game. The Flames finished with an impressive 5-0 win in Sunday’s final game over the Lloydminster PWM Steelers, paced by a two goal performance from Cecilia Lopez, solid team offense and defense and a well-earned shut-out by Tory Micklash. A 3-2 win vs the always-dangerous Shaftesbury Titans with Logan Angers holding strong in net and a very exciting 0-0 draw with the host team Pembina Valley, the day before, capped off a very successful weekend of hockey! Upon returning from Morden, the focus for the team was directed back to school work and getting ready for the 2nd Annual Female Hockey Fights Cancer (FHFC) game in Selkirk vs the Winnipeg Avros on Saturday, October 18. The game proved to be exciting however, was far and away overshadowed by the fact that a whopping $18,000 was raised and given in one massive cheque to Cancer Care Manitoba. Thanks to huge the huge fundraising efforts from the players and parents of both teams. A most memorable pre-game speech to the players, coaches and staff from cancer survivor Ladine Moldenhauer definitely left an indelible mark on everyone in the room. Huge thanks goes out to Dennis and Melanie Park, Don McIntosh, Monte Miller and Hockey Winnipeg, and especially to Coach Ashley van Aggelen and the entire Winnipeg Avros organization for inviting SMA to be a part of this event. Click here to view a Sportsnet clip of the FHFC game. Most recently the Flames skated to a 4-2 win vs the perennially strong Westman Wildcats Sunday October 19, 2014 at the MTS Iceplex. Strong goaltending from both Tory and Logan, combined with two markers by veteran Randi Marcon and singles from Kayla Friesen and Emma Smith-Andrushko paved the way to a fourth straight victory. Saturday, October 18, 2014 at 2:30 p.m.
A total of $18,000 was raised for CancerCare Manitoba! The Flames Prep team came home from Ontario on September 14th with a 3-1-2 record as Yellow Division champs in the Stoney Creek University Showcase Tournament. 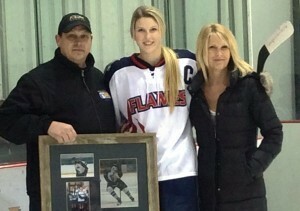 Congratulations to SMA Flames Prep player Christian Higham for making Team Canada’s women’s U18 team! Team Canada’s U18 team sees action against rival U.S.A in a best-of-three series that kicks off Aug. 21 in Calgary. Click here to go to Hockey Canada’s 2014-15 National Women’s Under-18 Team webpage.